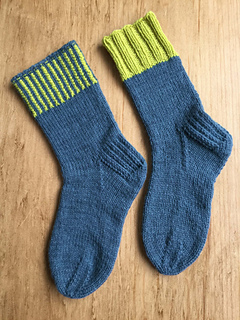 These unisex hiking socks can be knit with a variety of tops. The two-color version is stranded k1, p1 ribbing that creates a thicker, less elastic cuff. For a more traditional look, it could be worked in only one color. The one-color cuff is k2, p2 ribbing that also could be knit for a solid color sock. The pattern includes two sizes and was designed for light worsted weight yarns, such as Solitude Dorset Hike sock yarn.